TOKYO, Oct, 31 2018 - (JCN Newswire) - Having completed a large-scale hybrid power storage system in the City of Varel in Niedersachsen, NEDO, Hitachi Chemical Co., Ltd., Hitachi Power Solutions Co., Ltd. and NGK Insulators, Ltd. are starting to operate the system from November 1, 2018. The system consists of two types of storage batteries, lithium-ion and NaS batteries (total capacity: 11.5MW/22.5MWh) to take advantage of their different features. Utilizing lithium-ion batteries with a high power charge and discharge output, and the long duration capacity of NaS batteries, the system maintains the electric power supply and demand balance and aims to establish a business model for power trading through the system in the region where wind power adoption is accelerating. Germany aims to shift more than 80% of its domestic electric power demand to renewable energy by 2050 under its "Energiewende" energy transition policy by actively introducing renewable energy resources such as wind and solar power. Because of the recent expansion of renewable energy use in Germany, conventional power plants for maintaining electric power supply stability are falling into disuse. Consequently, there is a rapidly growing need for technology to replace the role of such power plants. To address the arising challenge, NEDO and the Ministry for Economics, Labor and Transport in the state are working together with EWE-Verband, an association managing the electric power supply to 17 districts and four cities in Niedersachsen, and EEW Holding. The four parties signed a memorandum of understanding (MOU) for the project on March 19, 2017. At the same time, Hitachi Chemical Co., Ltd.; Hitachi Power Solutions Co., Ltd.; and NGK Insulators, Ltd., Japanese companies commissioned by NEDO, and EWE AG, Niedersachsen's energy provider cooperating with the German parties, teamed up and concluded an implementation document (ID) to officially launch the project. The project started in April 2017. Following the City of Varel granting permission to establish a large-scale hybrid power storage system, the facility foundation construction and machine assembly were completed, and thereafter, a commissioning has been finished and hence operation will commence from November 1, 2018. A ceremony will be held to mark the operation of the large-scale hybrid power storage system at 10:00 a.m. (Central European Time - CET) on November 1, 2018. Takeshi Yagi Ambassador Extraordinary and Plenipotentiary of Japan to the Federal Republic of Germany, Enak Ferlemann Parliamentary State Secretary to the Federal Minister for Transport and Digital Infrastructure and many distinguished attendees will take part in the ceremony. The demonstration project will be carried out over a three-year period up to February 2020. 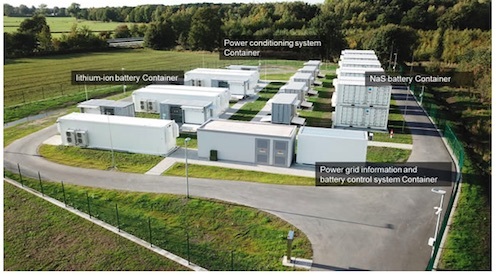 The project aims to demonstrate the effectiveness of the large-scale hybrid power storage system designed by taking advantage of the features of lithium-ion batteries (capacity: 7.5MW/2.5MWh) with a high power charge/discharge output and durable, large capacity NAS batteries (capacity: 4MW/20MWh), in combination with Hitachi Power Solutions' power grid information and battery control system(1) that controls the both batteries and enables the following four functions by communicating information for the electricity trading. Through this system, the four functions of primary control reserve(2) supply, secondary control reserve(3) supply, balancing(4) within a balancing group(5), and reactive power supply(6) that stabilize local grid voltage will be realized to replace the functions of conventional power plants. Electricity trading will be executed in line with the EWE Group's electricity trading system. Creating a virtual power plant (VPP)(7) in collaboration with Germany's "enera" project(8), various types of energy sources in the country will also be combined and managed for the electricity trading. The aims of this project are to contribute to maintaining an economical supply and demand balance and to ensure a non-variable supply from renewable energy sources.